Does your configuration enable automatic Chris21 skills processing and generate reminders when refresher training is due? display training courses that deliver the training in the skills in which the incumbent is deficient. Furthermore, with the correct setup, all the above-mentioned processes will happen automatically. Hence, there is less manual intervention needed by your training administrator and less chance that processes will be overlooked. I will assume that you currently do not record skills in Chris21 at this stage. But if you do have some minimal setup, then you may already have some skill codes in the system. In this case, you can ignore the first step in the list below. I will also assume that you already have Courses – CSD records and History – TRH records in your system. PSK – Position Skills. Add all the skills that position incumbents should possess. Now that you are familiar with the configuration forms and what they are used for, the next step is to update these forms according to your requirements. There are a few things you will want to think about before you start, to ensure that you set the system up just how you need it. For instance, do you want multiple skills to be associated with training courses, or will you just need a one to one mapping of course codes to skill codes? (I will go into detail about this in the next section). Another question might be, do all courses need refresh training or is it just some courses? And if they do, what is the refresh period? While these questions are important, it is not vital that you are aware of all the requirements before you start. You can always revisit forms to update your configuration at a later stage. 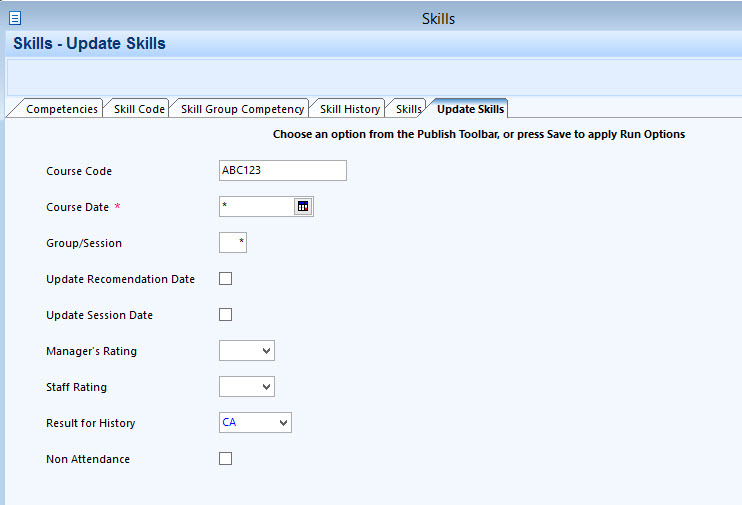 As mentioned earlier, the very first step when configuring Chris21 skills processing is to create the skill codes. You create skill codes using the Skill Code – SKI form. As previously mentioned, you can create a single skill code to match the course code. This is what we refer to as the one to one mapping and is the most basic configuration setup. In this case, you would create the skill code as an exact replica of the course code. 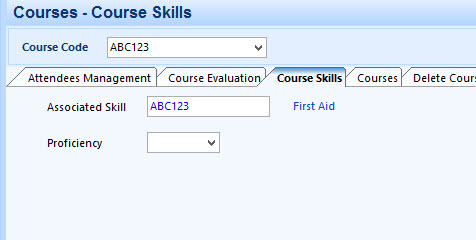 If the course code is ABC123, then you would create the skill code as ABC123. One small difficulty that you will probably face is with the number of characters available to you. The Course Code can be a maximum of 20 characters and the Description 174 characters, whereas the Skill Code can be a maximum of 16 characters and the Description 24 characters. This just means that in some cases the Skill Code descriptions will need to be abbreviated. When you use a one to one mapping, it simply means that the employee will be assigned the same Skill Code in their Skills – SKL record as the course code of the course they completed. For this scenario, you only need to create the ABC123 code in Skill Code – SKI. You will need to do this for all your current courses. 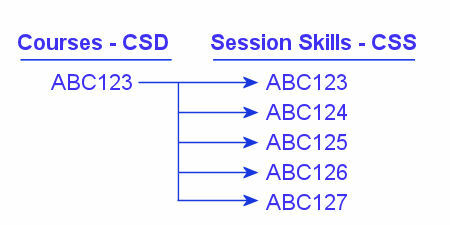 In other words, for each current Courses – CSD record you will need to create the corresponding Skill Code – SKI record. With this setup, whenever an employee completes a course they will be attributed with the corresponding single skill. If you want to make your configuration more sophisticated, you can set up for multiple skills per course. Once you have fully configured the system, any employee who successfully completes course ABC123 will gain four skills. In this example, four Skills – SKL records will be automatically created for each employee completing the course. I will explain how to associate skills with courses in the next section. But there is one more very important configuration step when creating Skill Code – SKI records. For skill refresh dates to be updated, the system needs to know what the expiry period is for each skill code. You do this by entering a value in the Skill Expires After field. This value is in months. Therefore, if a skill expires after two years, you would enter 24. 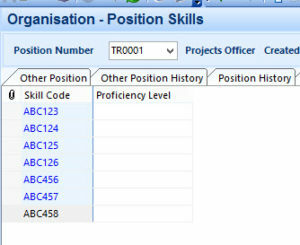 With this detail entered, the system can now determine the Next Refresh Date when creating the Skills – SKL record. This date is important because it is used to trigger reminder emails when a skill refresh is becoming due. I will talk more about this later in this post. In the previous section I talked about assigning skills to employees when they successfully complete courses. I said you can setup your system to associate one skill with a course (in this case, the skill code is the same as the course code) or you can associate any number of skills with a single course. To associate one or more skills to a course, you must firstly configure the Course Skills – CSK form. If you want to have a one to one mapping with the Courses – CSD record, then this is the only Course Skills – CSK record that you need to create. As you can see from the screenshot above, the Associated Skill is the same as the Course Code. Note that the Associated Skill comes from the Skill Code – SKI record from the previous section. Now, when employees successfully complete course ABC123 they each attain four new skills. This will be four new Skills – SKL records in Chris21. It’s very important to create Course Skills – CSK records when you create a new Courses – CSD record. If you don’t do this, then the process to automatically create Skills – SKL records will not be completed. This means that employees successfully completing training courses will not attain the appropriate skills. To reiterate, the CSK records must be in place prior to running the Update Skills process (I will discuss this process later in this post). It will not suffice to simply re-run the Update Skills process again if CSK records are added later. You can also create Session Skills – CSS records. This can be useful if a particular course session differs from the standard session for that Course. Course Skills – CSK records that have been created for a Course will automatically default to the Session Skills – CSS form. You can modify the Skills on CSS if required. Ultimately, it is the skills listed on CSS that the system will transfer to employees who successfully complete a session. This means that for just this single session, all employees who successfully complete the Course ABC123 will be attributed with five skills, the additional skill being ABC127. Earlier in this post I described the Skill Expires After field on the Skill Code – SKI form. This is the field that tells the system the length in months until the skill is due for refresh. When the SKL record is created, the Next Refresh Date will be calculated and populated based on the value in the Skill Expires After field. Provided that the Next Refresh Date is populated, we can set the system up to send a reminder email to the employee and/or manager when refresh training is due. The first field you enter is the Field Code. This must always be a date field. It is the date that will be used to trigger the reminder email. The other stipulation is that it must be the data dictionary Field Code. In this case SKL NXT REFR is the Chris21 Field Code for the Next Refresh Date on the Skills – SKL form. You will find the full list of Field Codes on the Data Dictionary – DMA form. The Offset Period is used to determine when the reminder email will be sent. Usually, you will want this to be before the date in question. In the example above, I have set the Offset Period to be one month before the Next Refresh Date. The correct syntax must be used. If you want to set the reminder to be three months before the date, then you would enter -3M. You can also use W for Weeks, D for Days and Y for Years. Create the Workgroup. You must create a Table – TAB entry on the WORKG table. You can have multiple workgroups. For example, you might want one for HR, Training, Administration, etc. 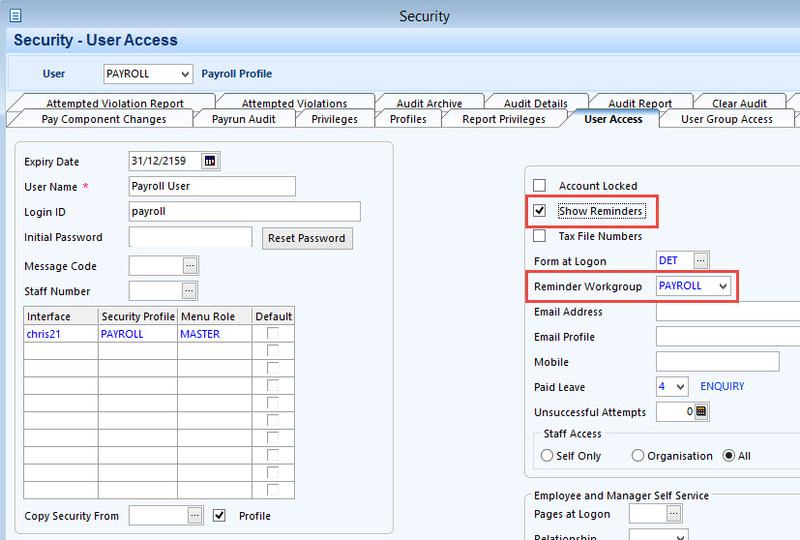 Notice above that the Reminder Workgroup field has the PAYROLL Workgroup selected. Also note that you must check the Show Reminders checkbox. It’s important to remember that the Automatic Entries – ADE record must be created before Skills – SKL records are created. This is because when the Next Refresh Date is entered and the record saved, then the email trigger is ‘set’. This means that any Skills – SKL records created prior to the creation of the ADE record won’t trigger any reminders. You can, however, reset the triggers by removing the Next Refresh Dates and then re-entering and re-saving the records. You use the Position Skills – PSK form to record all the skills that incumbents should possess in their position. This is essential if you want to produce skills gap analysis reports. To complete this part of the configuration you will have to determine what skills should be attached to each position in your organisation. Once you have this information at hand you can create the individual PSK records. As this can be a labour-intensive task, you can use the GTR process to electronically load the PSK records. This is not only a very efficient process, but it also validates each record as it is loaded to ensure only valid records enter the system. If you need more information about the GTR process, see my blog Increase Your Productivity Using GTR Processing. 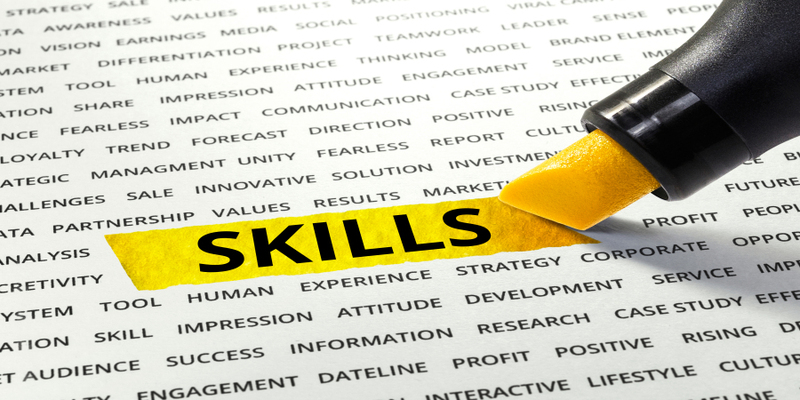 Once you have created a list of required skills for a position, you can look at the incumbents Skills – SKL records to determine where gaps in learning and skills exist. A quick glance shows that the employee is still missing three skills; ABC456, ABC457 and ABC458. Of course, in a real-life situation an employee could have a very large list of skills on both PSK and SKL. Standard Chris21 reports such as Skill Comparison – SKR can be run over multiple employees to provide detailed information about skill gaps. Now that you have completed the configuration, you can set the system up to automatically take care of the creation of Skills – SKL records and send reminders when skill refresher dates become due. I will describe the process once Training History – TRH records have been created in your system. There are a few different ways to produce the TRH records, therefore I won’t go into these in this post. Instead, I will assume that you are at the stage where you are regularly creating TRH records. Create Skill History – SKH records when a skill has been refreshed. This indicates that the course has been completed by the employee but that the Skills – SKL record has not been created. In other words, the employee has not been assigned the skill (or skills) associated with the Course. To ensure that Skills are assigned to employees you must run the Update Skills – SKU process. This process will look at the Course Skills – CSK records to determine the skills associated with the course. It will then automatically create all the relevant Skills records. The SKU record above will process all ABC123 training History – TRH records where the Skills Updated? field is unchecked. You enter an asterisk * in the Course Date field to ensure the process looks at all dates. SKU will automatically set the Skills Updated? checkbox to checked. This will ensure that subsequent process don’t recreate duplicate Skills records. If you want to run SKU over all courses, simply place an asterisk * in the Course Code field. Furthermore, you will notice that the Next Refresh Date has been populated. As described earlier, this date is calculated using the value entered in the Skill Expires After field on the Skill Code – SKI form. This has been set to 24 months for each of the entries on CSK and you can see this reflected above as 1/05/2019 – two years after the Last Refresh Date. If you have your Automatic Entries – ADE record setup, email reminder triggers have now been set for the Next Refresh Date on the Skills records created. In this example, the reminders will be sent one month prior to the Next Refresh Date and will be sent to the Employee and the Manager. The Update Skills process will also create Skill History – SKH records. A Skill History record will be created when an existing Skills – SKL record is updated after refresher training. Effectively, the existing record is moved to SKH and the most recent record appears on SKL. One last step to fully automate the process, is to schedule the Update Skills process to run automatically on a regular basis. It’s a good idea to schedule this process to run daily to ensure the system is always up to date. Remember that SKU will only process records where the Skills Updated? 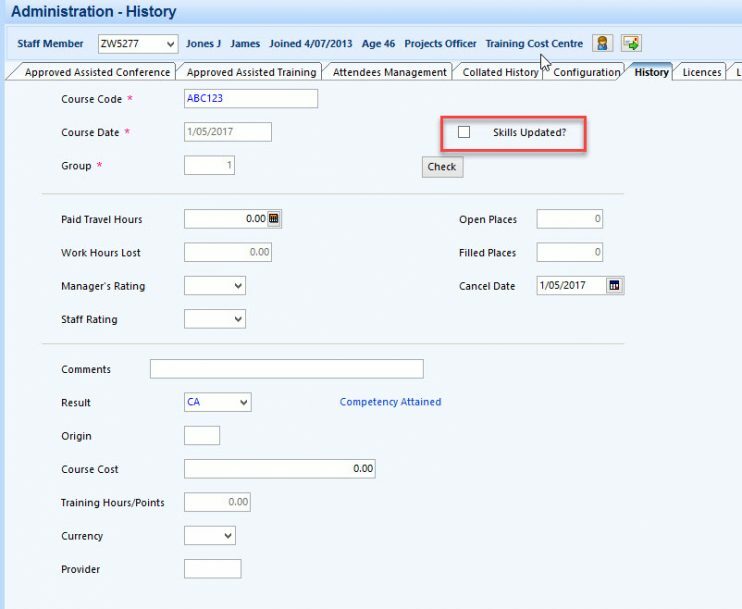 field on the training History – TRH form is unchecked. For help scheduling reports refer to my post Chris21 Quick Tip – How to Schedule Reports in Chris21. If you follow these configuration instructions, you will find that you will have an automated system that takes care of your Chris21 skills processing and generates timely reminders to employees to help ensure skills are always refreshed on time. You only need to update your configuration when new Course – CSD records are added to your system. If you have any questions or problems, or indeed if you have successfully implemented this process I would be interested to hear about it. I am very interested in learning Chris21 software. At the moment I am an accounts & admin officer in a warehouse. I’d like to change my career path to Payroll officer. It would be great if you can advise me how I can learn or be trained this software. I live in Adelaide South Australia.